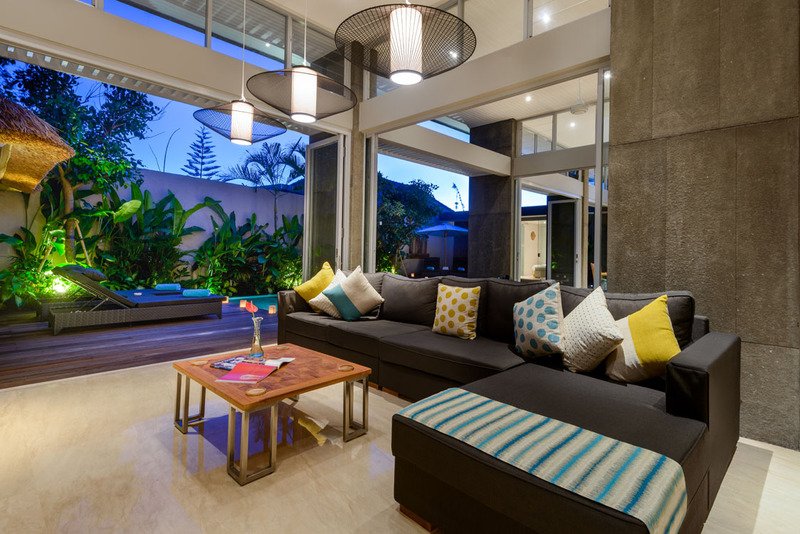 From $ 649 $ 584AUD per night We have direct contracts with most villa owners. We don't add any booking fees. We are 100% transparent with no nasty surprises. 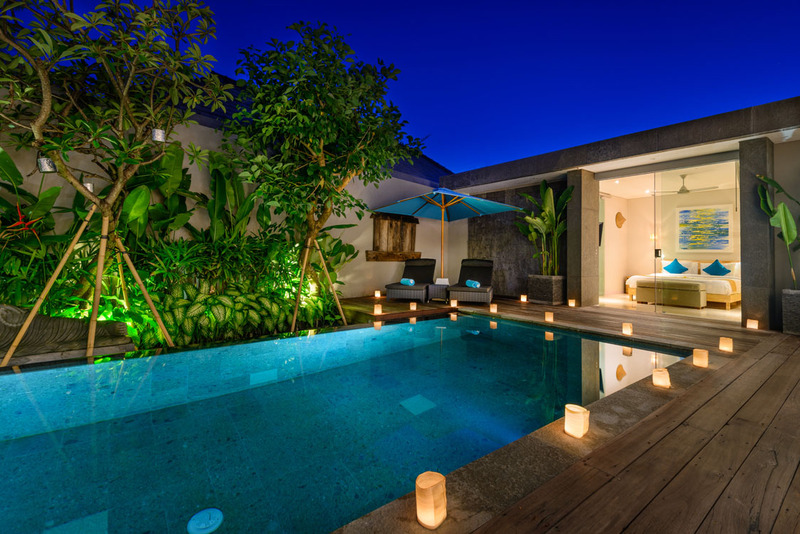 Top Seminyak location near beach - rent this now! 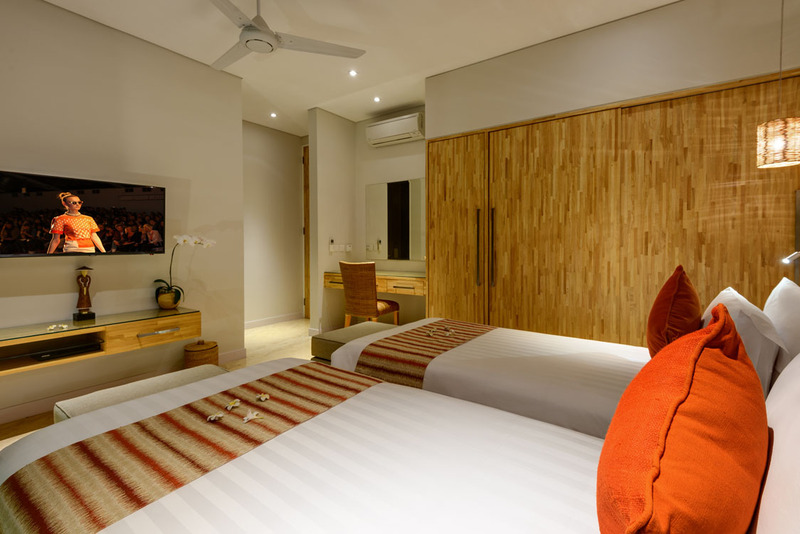 You are close to the heart of Seminyak’s vibrant ‘Eat St’ and Petitenget area. 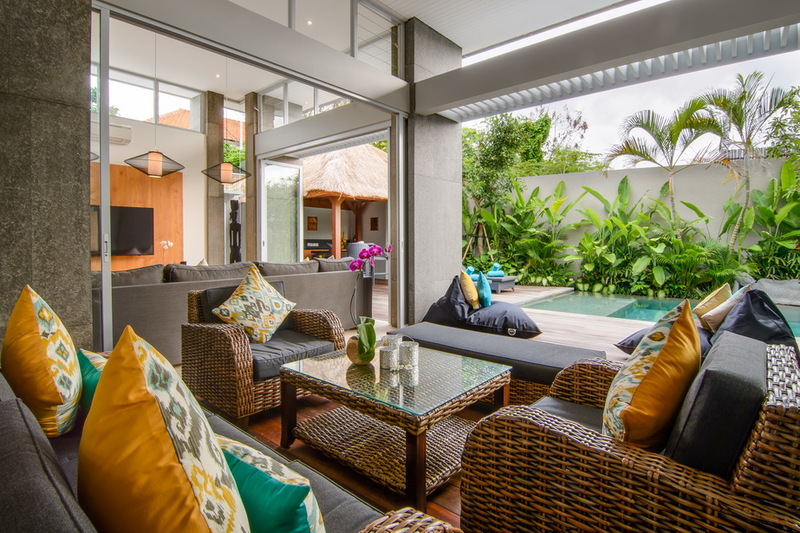 Villa Manis is part of The Aramanis villa complex and is a 4 bedroom Seminyak villa holiday rental which offers luxury private holiday accommodation with exceptional 5-star services. 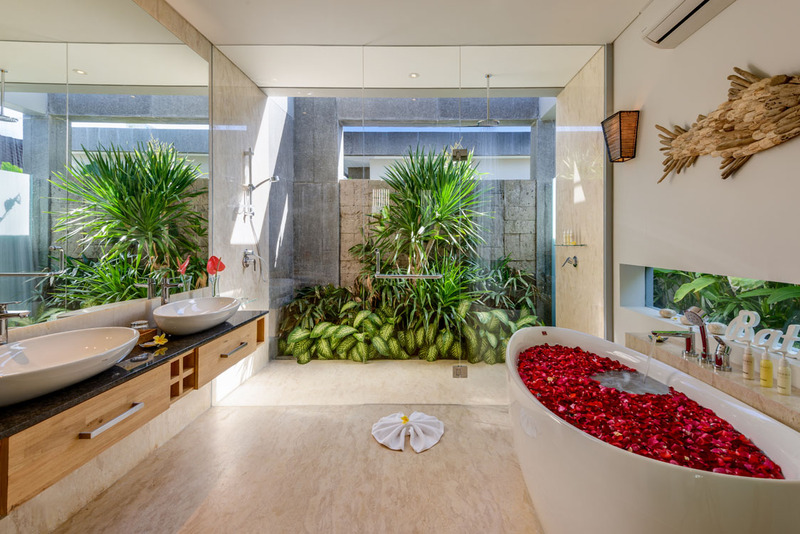 Guests will enjoy complete privacy & security in wonderful Seminyak location. 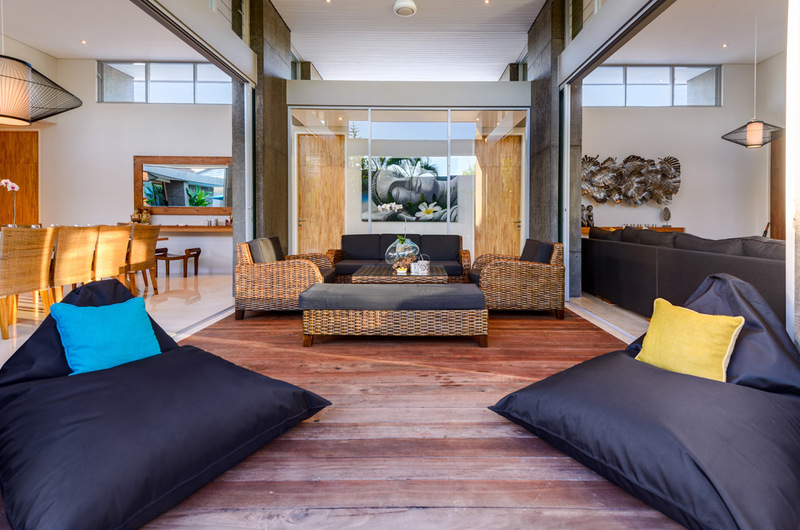 This modern villa offers all the creature comforts with exceptional amenities including a private pool and luxurious living areas and accommodation. 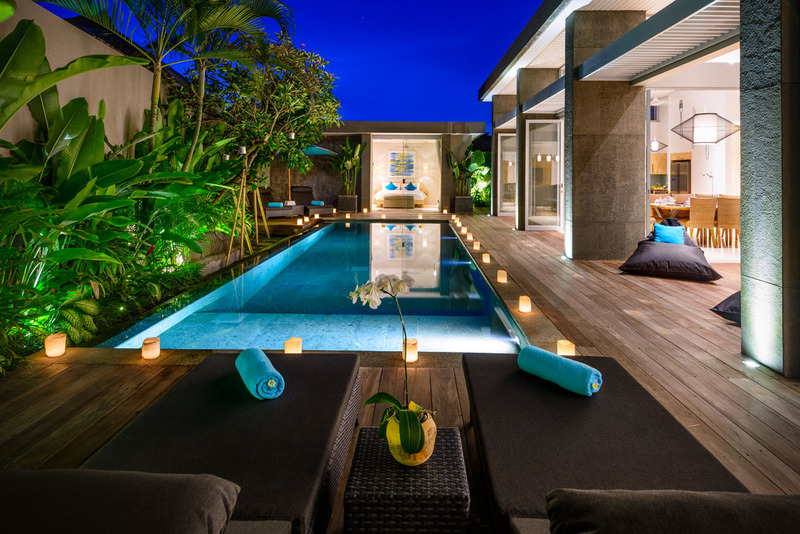 Guests can take a scooter or taxi to Seminyak and Double Six beaches or walk and explore all the restaurants, cafes and shops along the way. 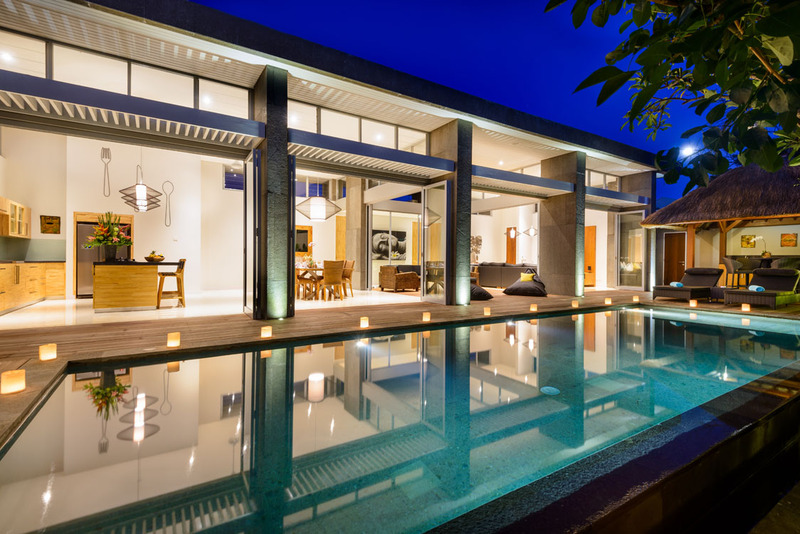 This villa is in a very central location. 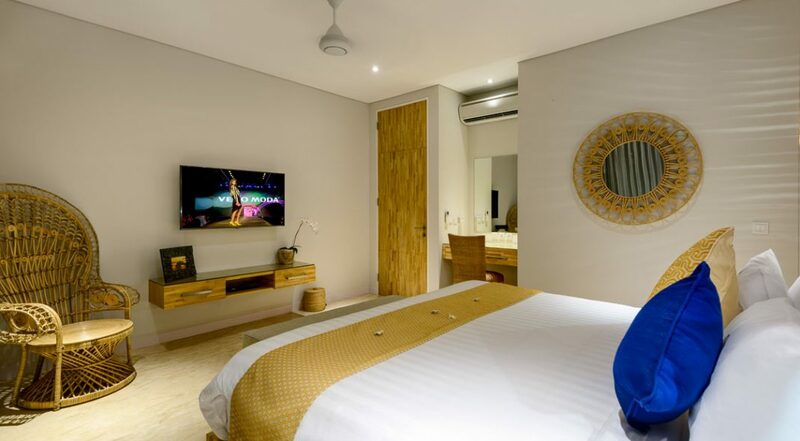 You are right in the heart of all the action, excitement that Seminyak is so famous for. 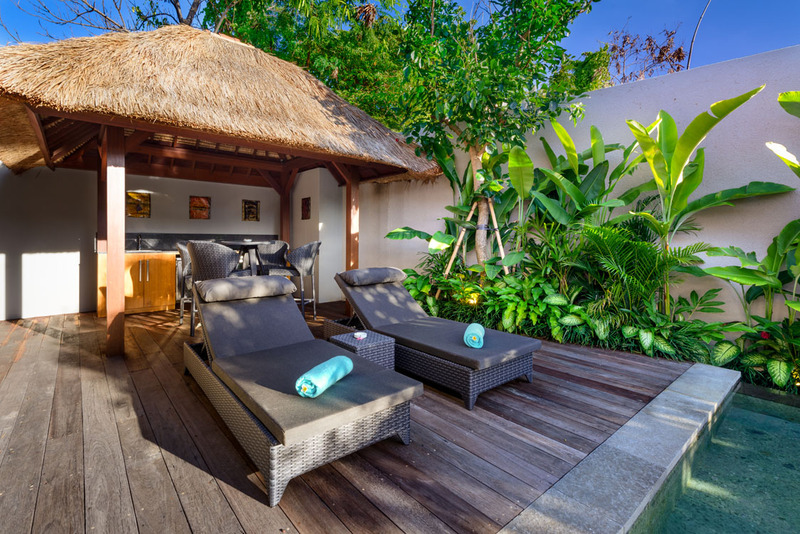 As you enter the villa you walk across the iron wood pool deck, a traditional bale to your left with an alang-alang roof houses an outdoor ratan setting and two rattan sun lounges for tan enthusiasts with fresh beach towels. 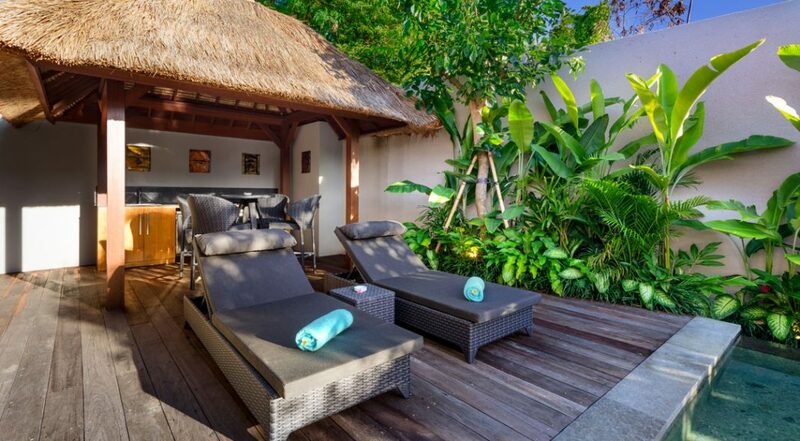 Down one side of the pool the tropical garden is bursting with exotic greenery and at the far end more sun lounges with a colourful parasol await. 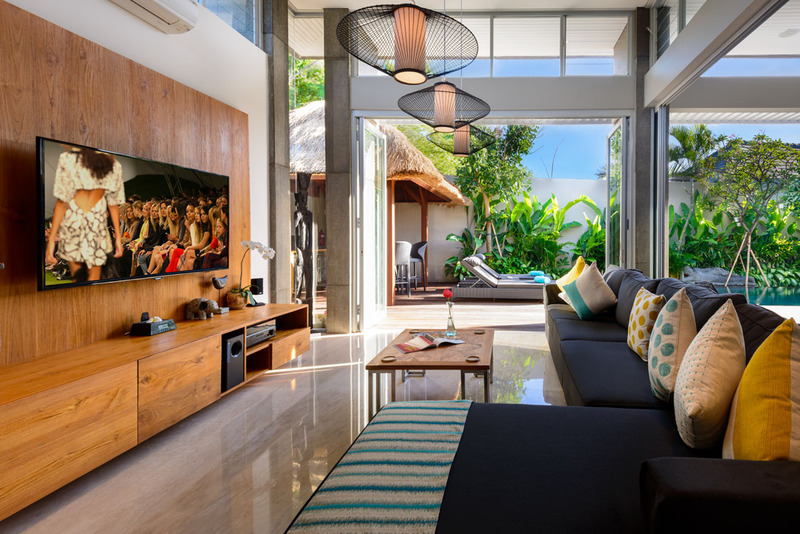 The villas smart design uses floor to ceiling glass panels to provide both indoor and outdoor lounge areas, at one end a large sofa and huge flat-screen can be enjoyed in air-conditioned comfort or open to the tropical ambience. 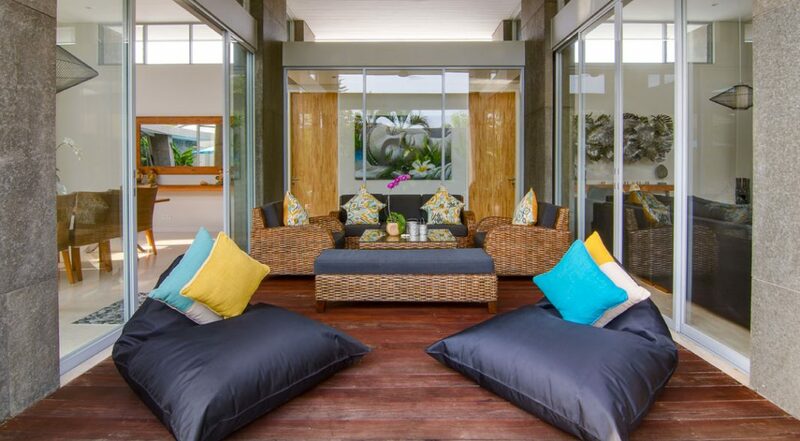 Behind there is another lounge with plush rattan sofas, tucked into an alcove for alfresco relaxation. 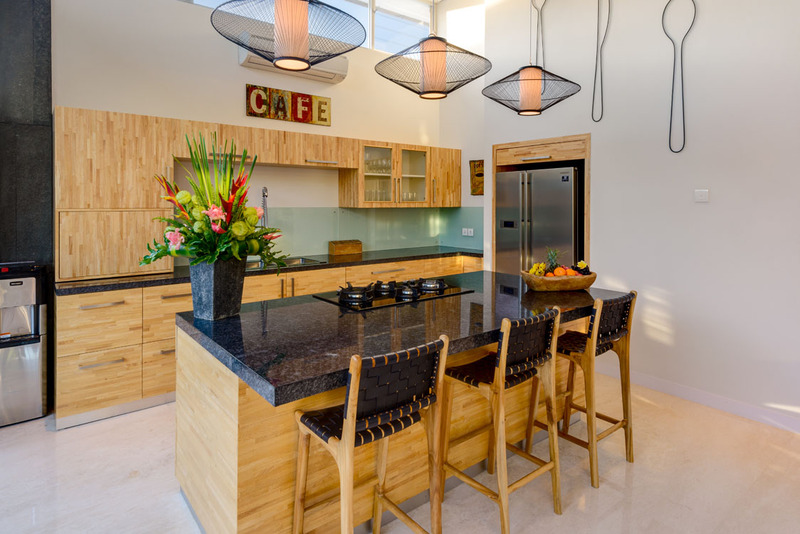 The kitchen and dining space is connected with a large timber dining table for up to 10 guests, the kitchen is modern with matching timbers and convenient island bench with bar stools to enjoy a morning coffee. 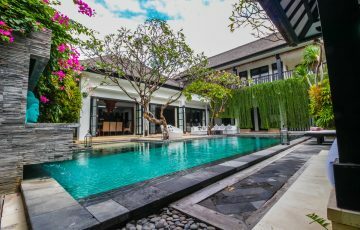 Villa Manis offers 4 gorgeous bedrooms, tastefully appointed with timber furnishings, built-in robes, writing desks and LCD TV’s. 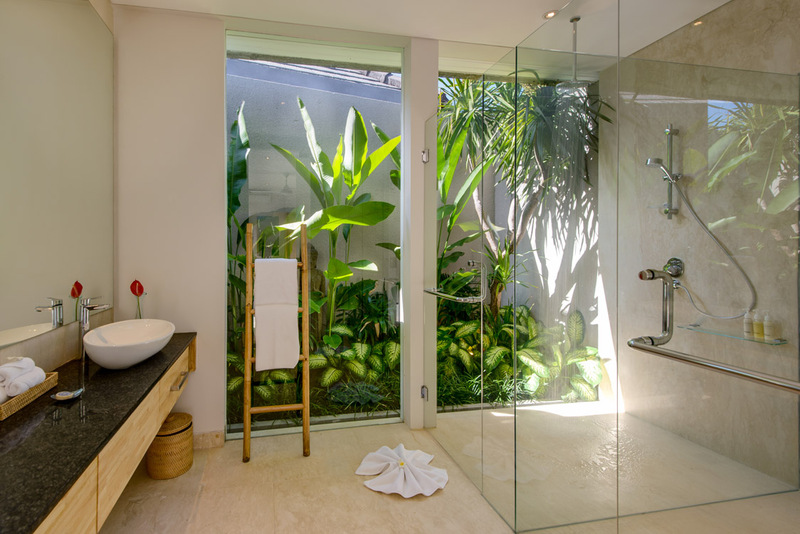 Selected art works add traditional character, the opulent en-suites provide the option to soak in the bath or enjoy the rain showers in the open-air. 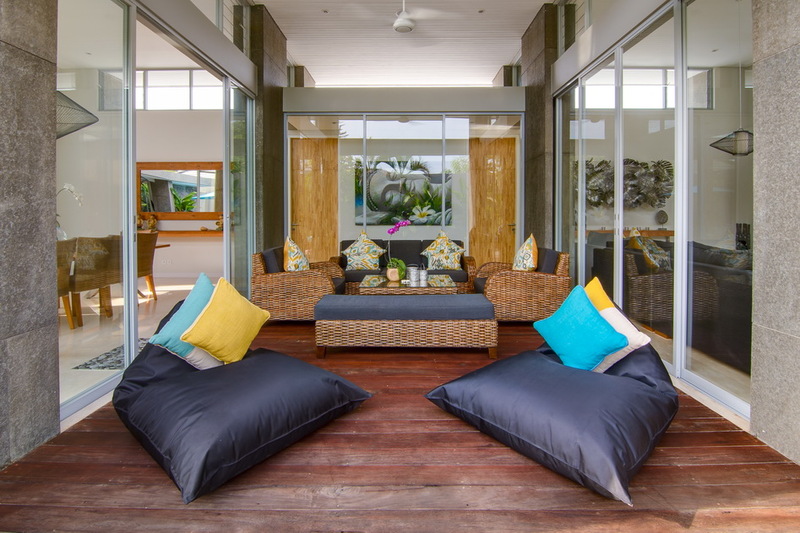 The villa complex staff are very experienced, professionally trained and fantastic with young children. 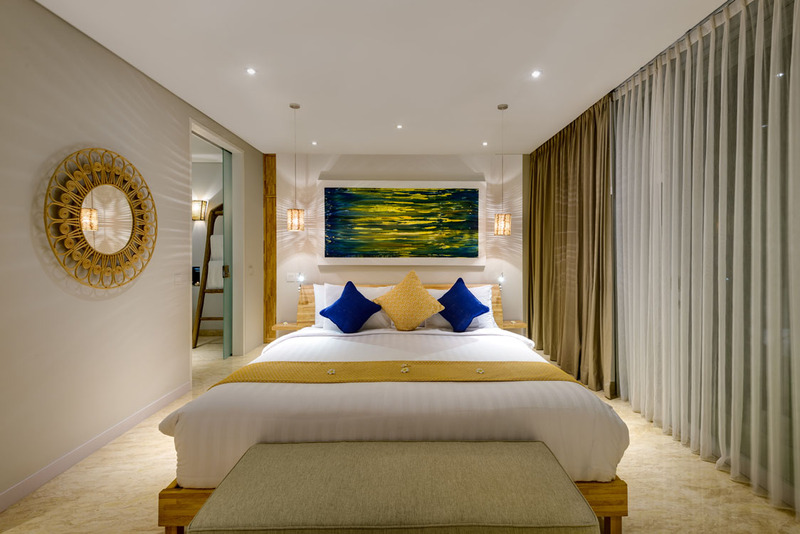 Just call the concierge desk for food and beverage service, in-house catering, babysitters and spa services or any transport needs. 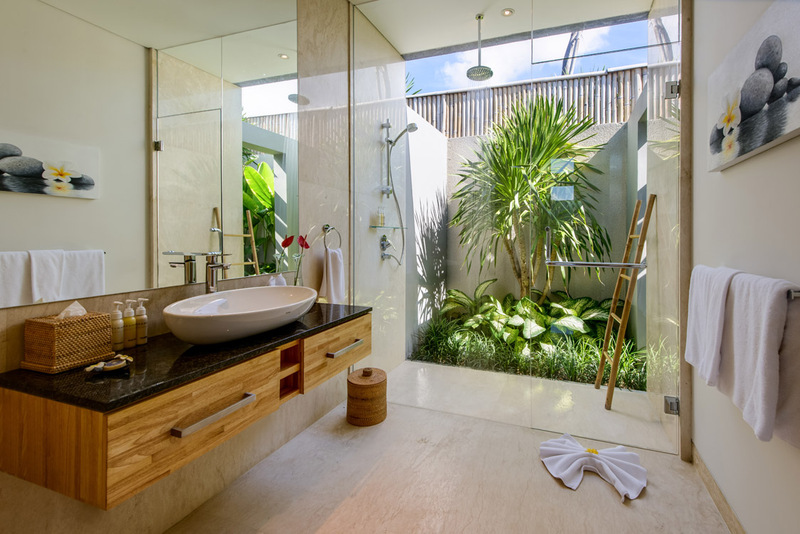 Turn left out of the complex and you will arrive at Jalan Raya Seminyak, continue straight and you will be down at the beach. 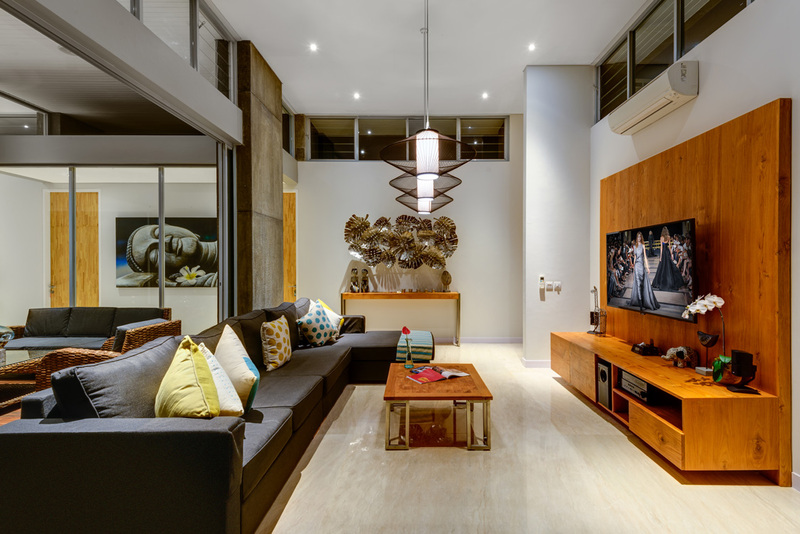 Jalan Raya Seminyak has lots of boutiques, shops, amazing cafes and casual dining options as well as Bintang supermarket ( where you can stock up on all your groceries, snacks, munchies, fruit / veggies and alcohol) with ATM’s. 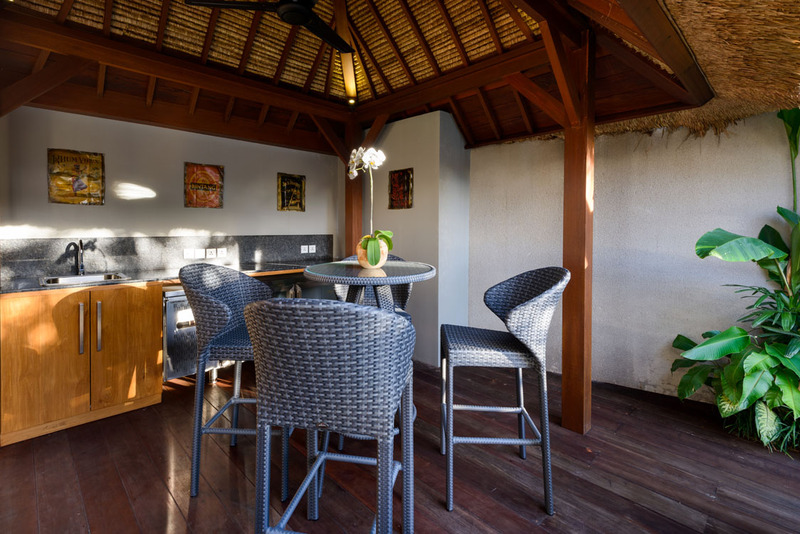 Jalan Oberoi is not far away where Mama San is a very popular restaurant and Revolover & The Corner House a great place for coffee and daytime lunch and snacks. 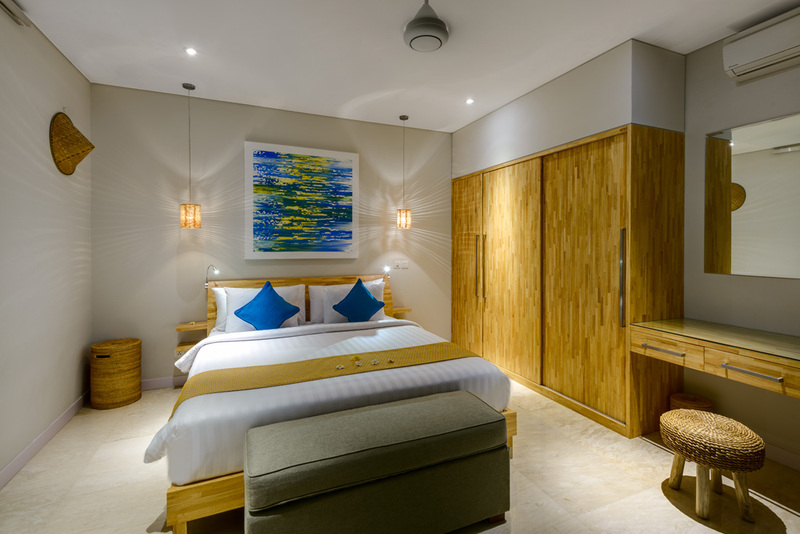 If your coming with kids make sure you head to Seminyak Square or Seminyak Village where there are loads of restaurants, cafes and shops to buy souvenirs. 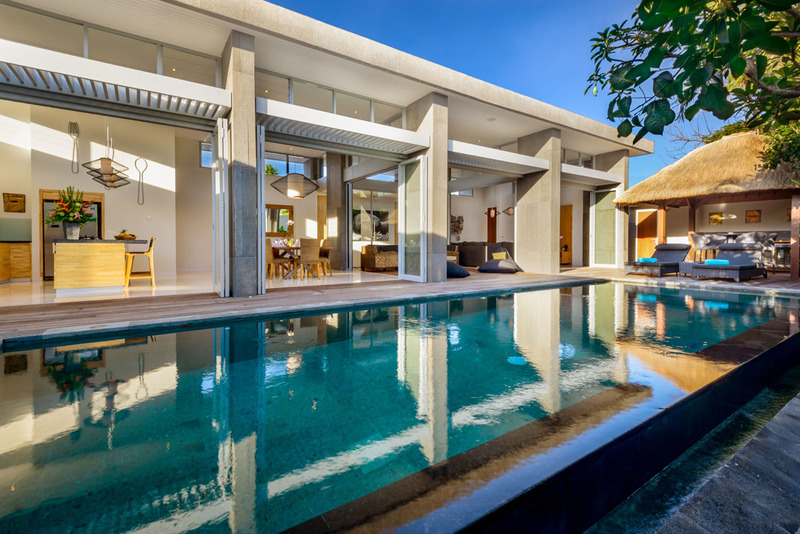 To view other large Bali villas or more Seminyak villas perfect for a family or group Bali holiday please browse this website or contact our reservation team. 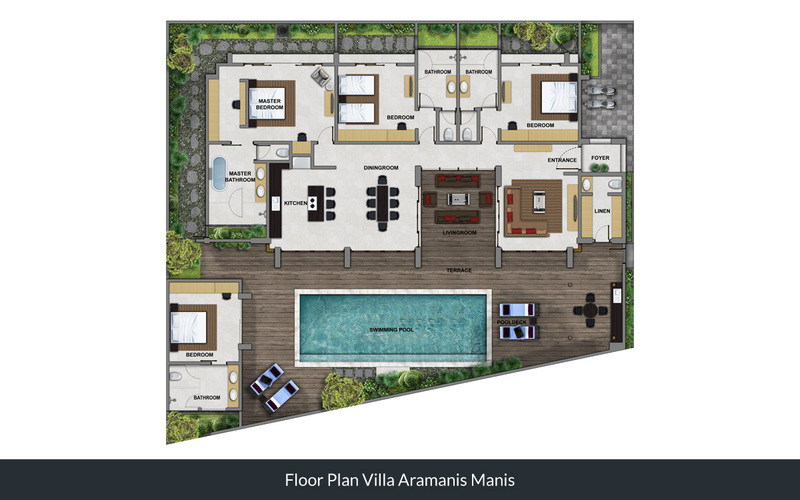 Please book villa Manis at Aramanis Villas in Seminyak well in advance as it is extremely popular especially during the Australian school & public holidays. 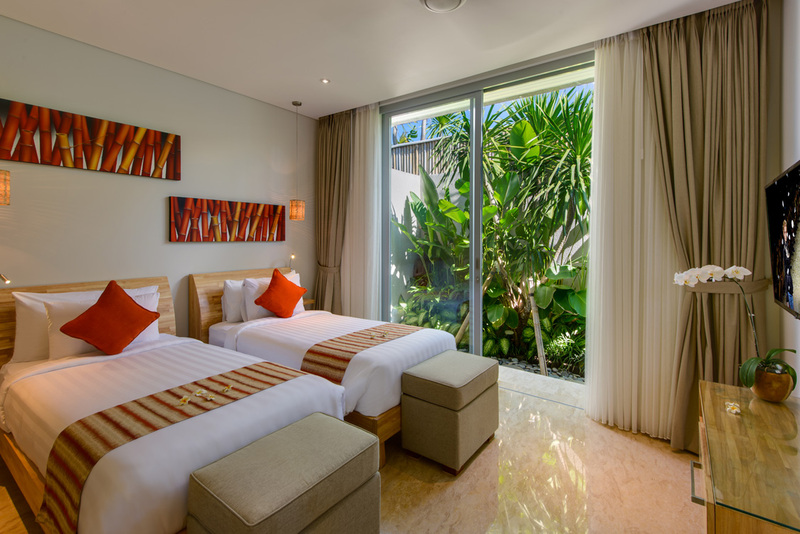 4 bedrooms which are all fully air conditioned sleep 8 guests comfortably. 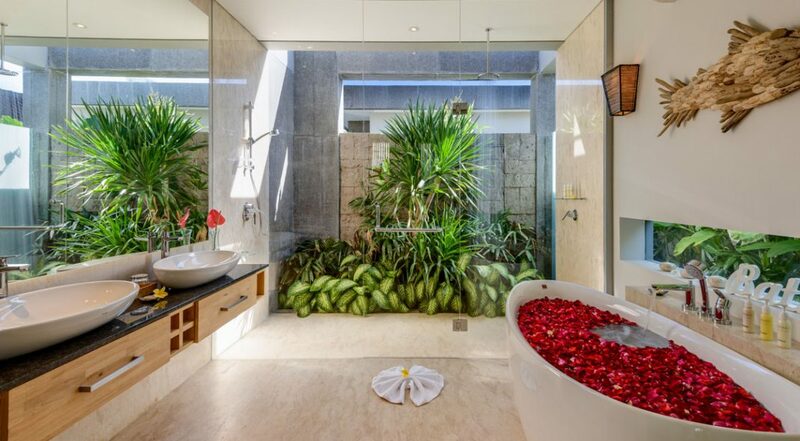 Guests of the master bedroom enjoy a large suite complete with a walk through wardrobe, large make up station, and an en suite featuring a deep free-standing soaking tub overlooking the bathroom’s private garden. All rates are quoted in AUD. 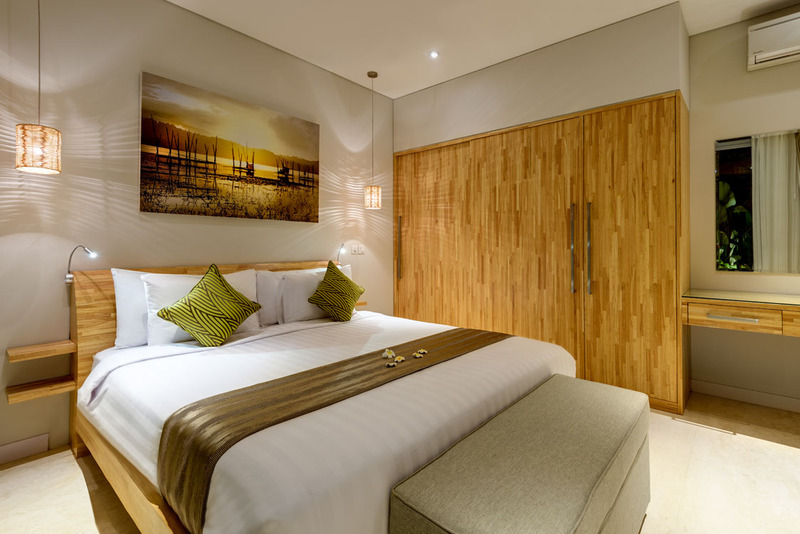 Stay of 5 or more nights, will include Return Airport transfers (1 x arrival & 1 x departure). 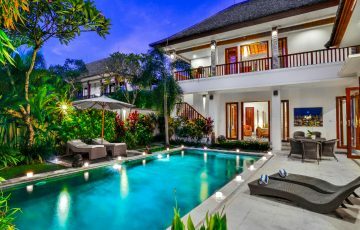 Our stay here at Villa Manis was so much better than we expected. 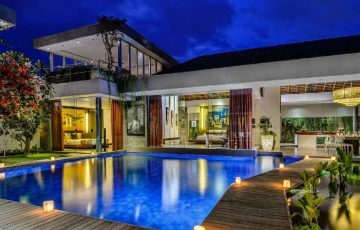 This home away from home came with all the luxury extras you'd only hope to find in a 5 star hotel but was much better value for money. Considering you get 4 bedrooms this is a real bargain. It was pure bliss, from the moment we entered. 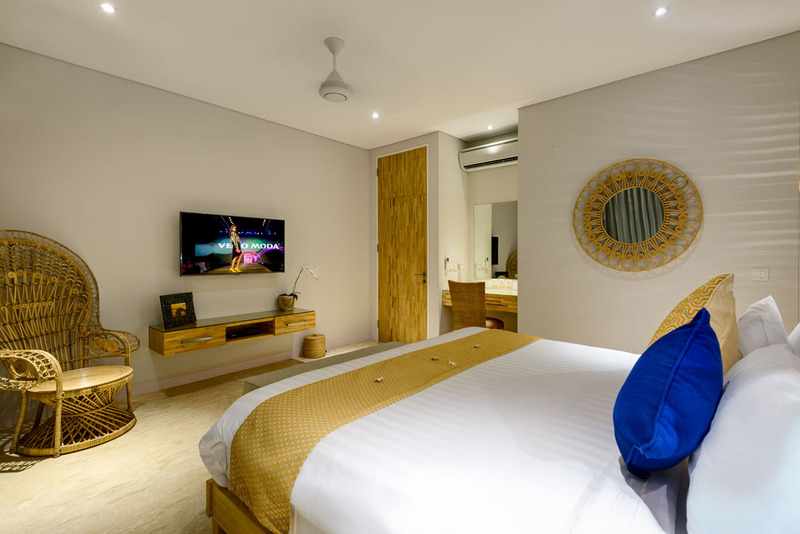 The location of Manis meant that we were at the centre of the action, moments from the beach and moments away from Seminyaks best attractions which was a huge bonus as we do love to shop. The villa staff (Yayuk and Ina) were really helpful and polite and we will miss their warm smiles every morning. 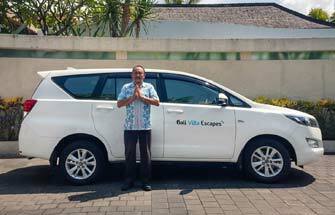 Thank you to the team at Bali Villa Escapes for organising this so quickly and responding to all our emails - we would highly recommend this villa for any family or group wanting a holiday villa with super friendly staff, that's in a great position that's also clean, modern and comfortable - this is a 10 out of 10! 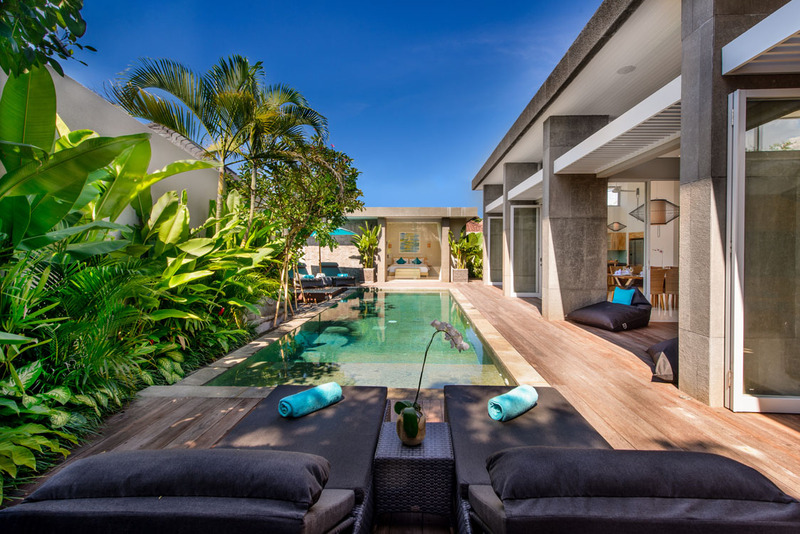 We spent 8 days here with another family and loved the villa from the moment we arrived. It was seriously gorgeous! The rooms, pool and living areas were fabulous and the villa staff cooked us and the kids the most amazing breakfasts. 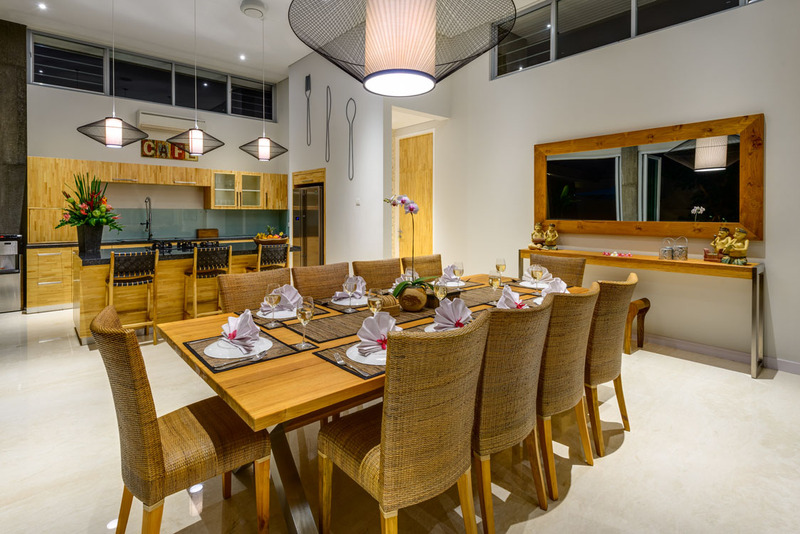 Being centrally located in Seminyak meant that we could easily try different restaurants and night for dinner which was a a huge bonus as it kept the kids entertained. 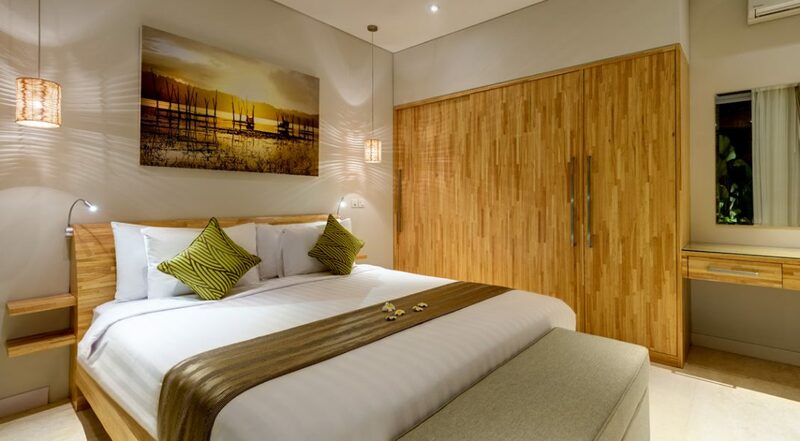 All room were meticulously presented and we felt as though we were in a 5 star hotel - we have already recommended this to our friends. For the price per night this is so worth it! 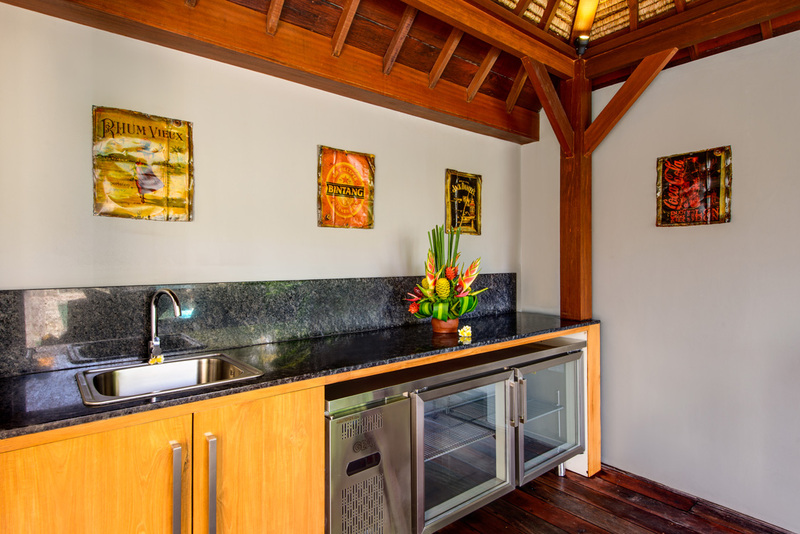 Wonderful location and top facilities make this villa an unforgettable experience. 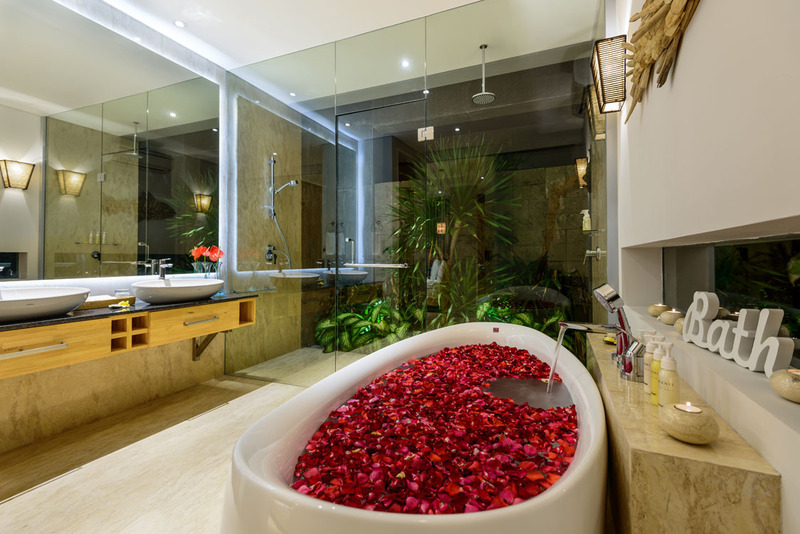 If your looking for the WOW factor Villa Manis is it! 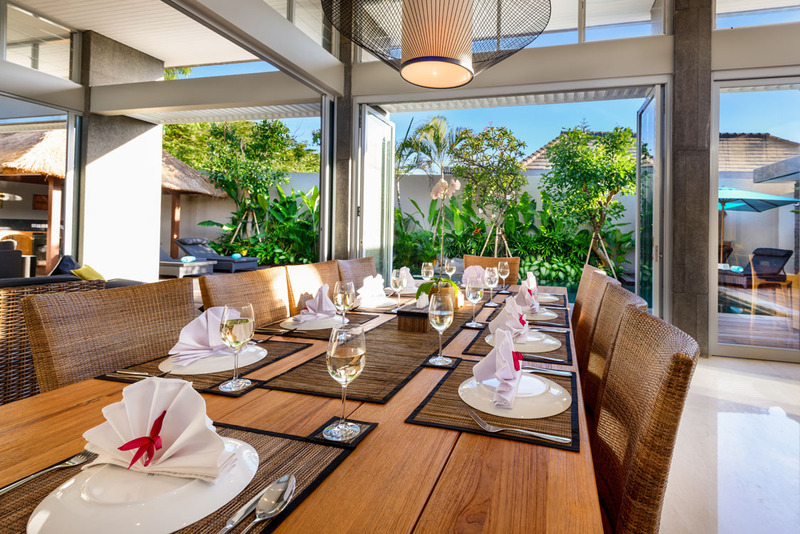 Highly recommended villa with an awesome location and very friendly staff - our family loved those breakfasts cooked for us by the pool. We are coming back. We had the best time at the vill and never wanted to leave. Lovely staff who really looked after us and made sure we were always as happy as possible. So professional!! 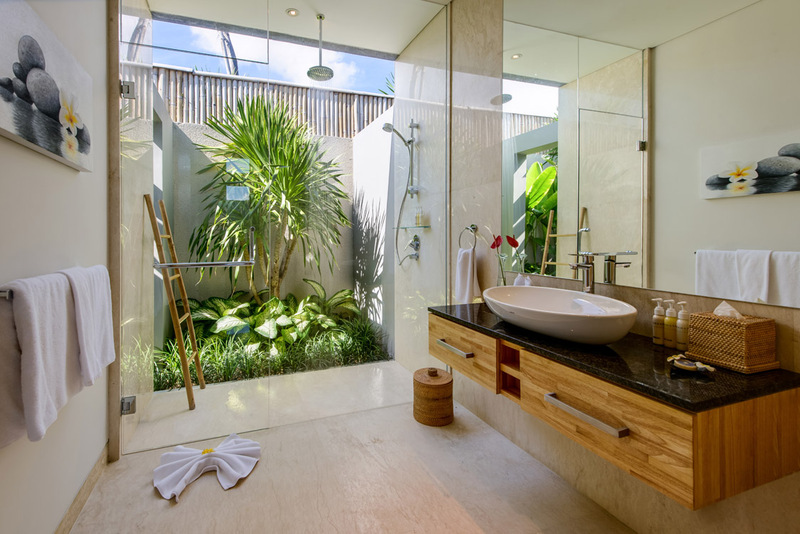 The villa facilities such as the pool, bedrooms, ensuites, kitchen and tv area were all 5 star. 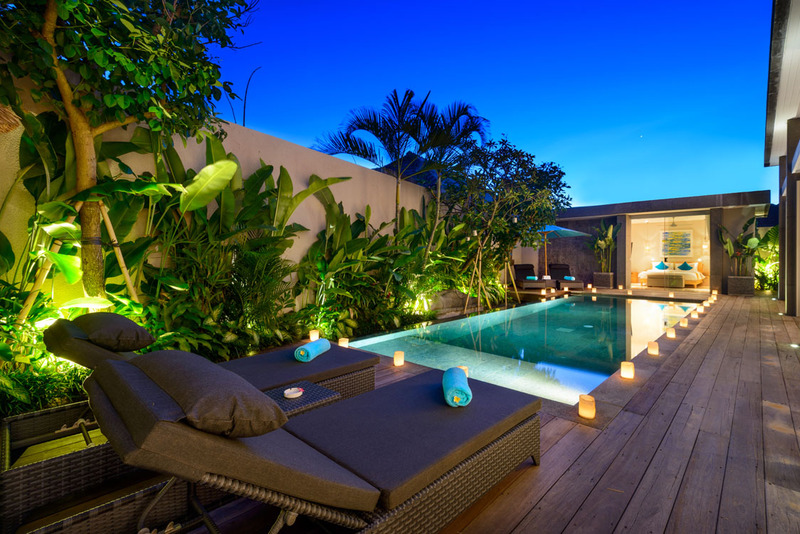 The area was so chilled out and really peaceful with the convenience of Seminyak's best places so close by. 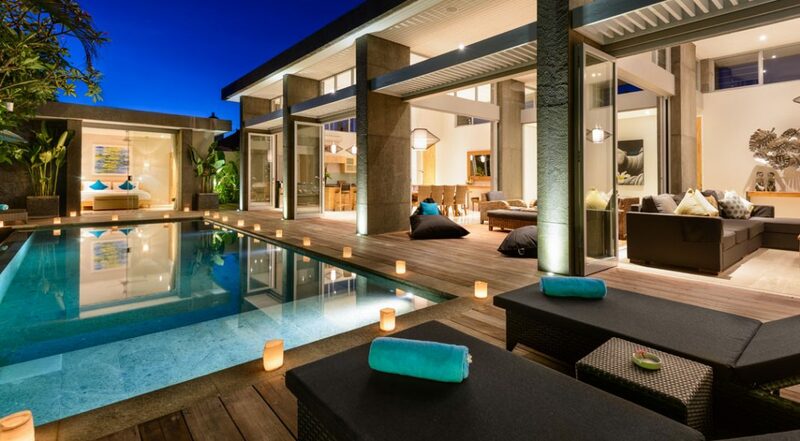 This is definitely a top villa. 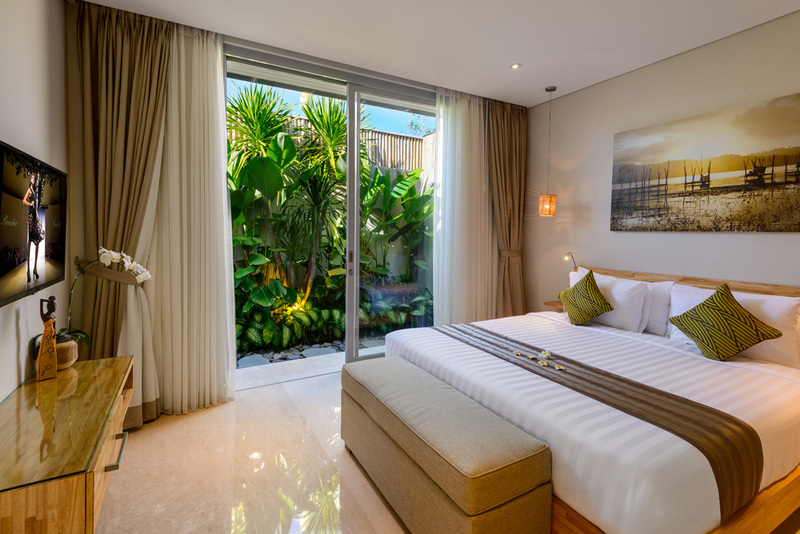 Make sure you stay here.